What is there not to love about a typewriter called Baby? Never mind all the references you find to Hemingway/ Steinbeck/ insert-famous-author having used this typewriter, but the name alone, and the beautifully-rendered logo, is enough to get this machine a second look. Most every collector will have one of these, but of all the "Baby"s we've come across, this is the one we're keeping. A look at this machine's profile shows how flat it is - truly an ultra-portable, traveling typewriter. In its case, it is barely 40cm high and 10cm wide - I can fit four of these in an Ikea Expedit compartment with room to spare.This is a machine that I barely have to think twice about when I find for a good price - its narrow profile and compact body means that it is never too large to take home. Fortunately the gull-wing covers on this one are in good shape and fit snugly when closed, although the metal is quite thin and can be easily bent. When we met Jacques Perrier at his typewriter museum in Lausanne a month ago, he bemoaned the state of typewriters in Switzerland, despite having more than 1,000! What he said, actually, was that it was hard to find collectible typewriters, and when you do find them, they are all Hermes! Well, it may be easy to find your run of the mill QWERTZ Hermes typewriters, but this is a QWERTY with a Spanish keyboard! This machine officially marked my transition from user to collector - I had a perfectly fine white plastic qwertz Hermes Baby, but I saw this one and literally squealed. Now, though, I find that since all our other machines are qwertz anyway, I have gotten used to that layout and make mistakes on qwerty! I believe this Triumph Tippa was manufactured sometime in the late '50s, pretty soon after Triumph acquired the license to build the original Gossen Tippa. This model is virtually identical to the Gossen Tippa, which has been exhaustively documented on Will Davis' site. I rather like the maroon color of his, but this shade of brown is not too bad either. While we acquired this typewriter in Switzerland, it is evident that it originally came from Germany. Typewriters from the German market usually have an uppercase U with umlauts after qwertzuiop, while those for the Swiss market have a lowercase u with umlauts (ü) /e with accent aigue (é). While the effect is still "qwertzuiopü", the added é makes it more French language friendly. As can be seen from the side profile, this is a fairly flat machine, although the bottom and case give it an additional footprint. I do wish it was more closely fitted to the machine, however. The gull-wing ribbon covers are more subtle than those found on the Hermes Baby, and I attribute this to the chrome trim which conceals the hinge. I imagine this elegant design was highly prized in the 50s, and I would say it still retains much of its aesthetic appeal. This particular specimen came to us rather well preserved, with the manual and key. The document flap inside the top cover of the case is color-coordinated with the keytops and indeed the rest of the machine. In terms of font, the Triumph Tippa has a very readable 10-characters-per-inch Pica. The typing action is very good - the keys do not need much urging, and the carriage moves quickly to keep up. I suspect our platen is particularly hard because the type slugs thwack rather loudly, but this is improved by using a second sheet as backing. I'm not sure if we'll ever get around to restoring any of our platens, as the process is quite costly here. This Tippa would be a good candidate, though. While it may not get as much use as our various Hermes machines, this typewriter scores high with me for its good looks. I feel the case is quite sturdy and the handle can comfortably carry the weight of the machine, while the sliding metal handle of a Hermes Baby does not inspire much confidence at all. If I had to bring only one machine to a typewriter show-and-tell, this sleek and stylish Tippa just might be it. This is an odd bird, the Brosette. I had heard of its extremely rare, almost-mythical nature, and so when one popped up on eBay, I leapt in and bid at the last moment and won the auction. It arrived in functioning, but grimy condition, and I scrutinized it carefully to see what was so special about it. One thing is certain - this all-metal typewriter from the mid-50s is built like a tank. There are some quirks to it: the margin settings are reversed, for example, so the right margin stop controls the left side of the paper. You quickly get used to it, like riding backwards in the train. Because of this, the bell is also on the left. You can see it in the picture below, and also note that the numbers increase from left to right, exactly the reverse from every other typewriter I've used. I have read on Will Davis' site that only a few of these machines were manufactured, but the serial number on mine is in the 38,000s. I don't think it is quite so rare! Perhaps, as is usually the case, there are few to be found in still-usable condition. This one is in solidly average condition - quite a few of the screws are rusty, there are a few chips in the paint, and the chrome finish on the carriage return lever is a tad chipped. The case, on the other hand, could not be salvaged. It was originally blue vinyl and had fallen apart badly; the zipper was ripped out completely and had frayed so much it could not be repaired. It was with much regret that we discarded it. My favorite part of the Brosette is the logo. Such a beautifully-rendered B! If there is any part of the machine that is completely ordinary, it is the Pica, 10-characters-per-inch font. It is virtually indistinguishable from the font on my ABC, and for that reason it violates my rule of only keeping one machine with a particular typeface. While it writes fine, the action is still a little stiff, and I would not want to write with it for long stretches, at least until it's loosened up with regular use. I'm hanging on to this one for now, but the jury is still out on whether it will be a firm part of my collection. I'm sure it has no resale value, because anyone looking for a typewriter merely to write with will not know anything of the Brosette's rarity or its place in German typewriter history. I am happy to give it a good home for now and take it for a spin from time to time, but eventually it would be great to swap it (*hint, hint*) for a nice machine with an interesting typeface. Fellow collectors, any takers? While my venture is on hiatus, there is no reason to let this domain go to waste, so we decided to create a photographic catalog of our modest collection, writing it in the style of our advertisements. Hopefully, this shall be of some use to fellow collectors - and one in particular who is following this blog! So, I shall start off my collection cataloging with this gorgeous ABC typewriter, manufactured by Koch Adlernahmaschinenwerke AG in Bielefeld, West Germany, sometime in the early sixties. ABC typewriters are highly-prized for their sleek curves and good looks, and this one is no different. It features a full metal body with a green hammertone finish, and plastic beige keys and platen knobs. According to Will Davis, three variants of this machine were manufactured, the 2- , 3- , and 4- , distinguishable by serial numbers and special features. This is a 4- variant, and so it has an in-built option for changing the ribbon color. I find the placement of the lever, which is close to the carriage on the right, very simple and elegant. In terms of typing action, the machine performs well. I am fortunate to have a particularly well-preserved specimen, in that the platen is still in good condition and the typeface comes through clearly. The font is a rather plain and ordinary pica, but it is crisp and readable. The Japy Script (already pictured), white Hermes Baby (already pictured), and Brosette (to come!) all have this same font. It is why I would rather not keep all of them. I do have a couple of problems with this machine, however: the margins do not always hold (they slip by a space or two every other line), and the line spacing lever shifts the platen up unevenly (sometimes more, sometimes less), so that I have to adjust it myself to create a uniform text. The paper finger, also, does not stay up! (Although I nudged it there for this picture.) I am sure there is a simple solution to this (a missing spring? ), so hopefully J will be able to suggest an easy fix. That said, this is a great piece of eye candy, and it is nice to type on to boot. It is fairly small, and in the case comes to just under 40cm tall. The case snaps on to the front, and I do appreciate how the bottom of it serves as an impromptu typing pad. Indeed, it is possible to remove the machine entirely from the bottom, but I like it better with, so I leave it on when in use. 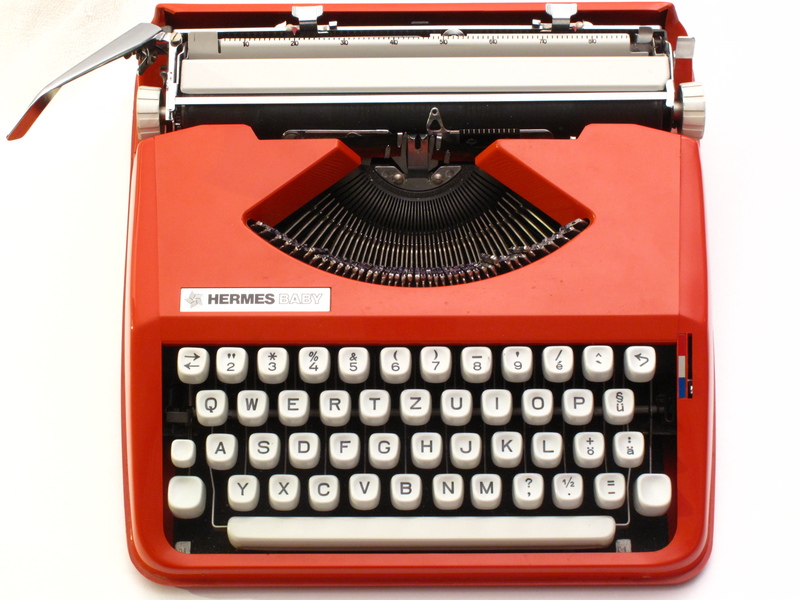 The Hermes 3000 typewriter was introduced by Paillard SA (Yverdon, Switzerland) in 1958. The machine was an instant hit and was prized by many writers around the world, including Jack Kerouac and Larry McMurtry, screenwriter for "Brokeback Mountain", who praised his typewriter during his acceptance speech at the Golden Globe Awards in 2006. 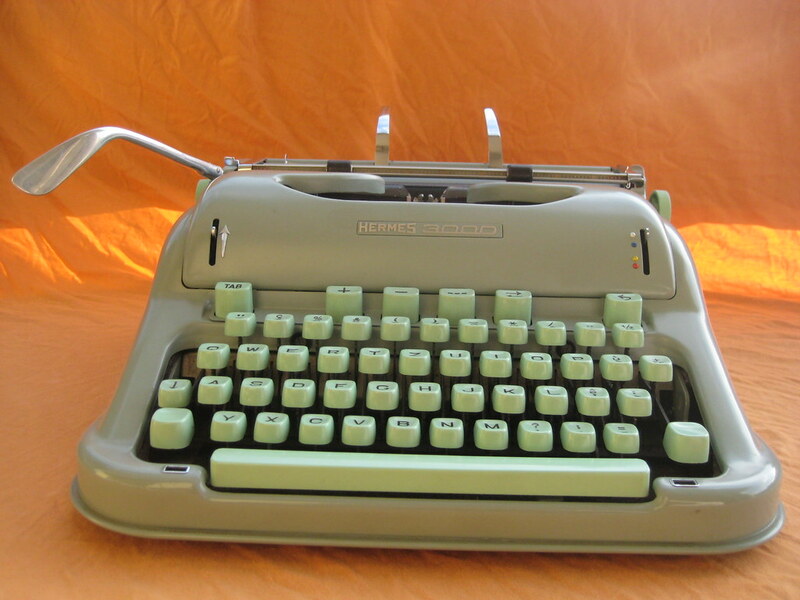 The Hermes 3000 typewriter features a curvy green full-metal shell, with light green plastic keys and platen knobs. The machine is coveted both for its highly pleasing looks as well as for its precise feel. The Hermes Media 3 is exactly the same machine as the 3000, but has been somewhat simplified. An original price listing from a Geneva retailer in 1968 shows that the Media 3 was listed at 100 francs less than the 3000. The typing action on this machine is to die for. It is light, precise, and instantly responsive. The typeface is crisp, even, and beautifully rendered. This is a fine piece of Swiss engineering, and it is 100% made in Switzerland. (If, of all the machines I am selling, I could keep just one for myself, this would be THE one.) Included are original cleaning brushes from Hermes. The case has an integrated spring-loaded document holder. Many subtle touches combine to make this a treasured and ultimately useful piece, including a basket shift mechanism (as compared to carriage shift in the Hermes 2000) that makes it easy to type out capital letters and symbols. The margin mechanism is very advanced and takes some getting used to, but I can show you how and I will provide a copy of the English manual. The 3000/ Media 3 is more of a "desktop" portable manual typewriter than a laptop. However, it comes with an integrated clamshell style light green metal carrying case, and can easily be moved around. In any case, the added heft means that it is extremely comfortable to type on for extended periods. The font on this machine is elite (12 characters per inch). It is smaller, but still well-spaced and very readable. The keyboard has all the accent keys necessary for typing in French or German, and, unusually, it features both a $ symbol as well as a Fr. symbol for Swiss Francs. The Media 3 can take a dual ribbon and type in either black or red. The ribbon has just been replaced and will be good for many years to come. This particular machine is in pristine, immaculate condition, and I would describe it as a time capsule from the 60s! Please contact if interested. The body of the machine as well as the keys is made from molded plastic, but the interior mechanism is all-steel and is based on Olivetti's famous Lettera machines. The typewriter comes with a matching black case, and is eminently portable, although not ultra-small. The plastic keys are very comfortable to use, and are reminiscent of early computer keyboard keys. There is a tab function (red key), and dual-color ribbon (black and red). The font style is Pica, which looks like a large Times New Roman. In fact, it most resembles the American Typewriter font that Apple includes in its office suite. As you can see, it is sober, well-spaced, and very readable. Ribbon has just been replaced, and may be found at good stationery stores. Please contact if interested. This machine has been thoroughly cleaned and serviced inside and out. Many hours of work have gone into making it presentable and fully functional. To see some pictures of the cleaning process, please read more. The Japy Script typewriter was designed and manufactured in France by Japy Freres & Cie, a watch manufacturer that diversified production into typewriters at the beginning of the 20th century. This model is from the 1960s, and it features full-metal construction, with plastic keys and platen knobs. The color is two-tone: slate-blue on the top and light gray on the bottom. The paint finish is still very good for its age, with a couple of negligible chips. This machine was built to last, and has many more years of life left. I love the elegant swoop of the carriage return lever! A closer view of the logo, and a better look at the machine's paint finish. It can type in black or red, and the font is pica - not too small, well-spaced and eminently readable. The typewriter itself has been cleaned thoroughly and performs well; the margin bell rings clearly at the end of each line. The individual type slugs have also been cleaned, so that the type is crisp and clear. It is quite small and light and can easily be stashed in a large purse to take outdoors, or moved around the house. Another creative use for a typewriter is to set it up as a "guest book" for weddings and other events. Your guests will be delighted to type out their good wishes! Ribbon has just been replaced and will be good for a long while. Replacement ribbons can easily be found at Papeterie Wolf in Geneva. Pick up in Eaux Vives. Please contact me for more details or to view the machine. The Hermes 2000 typewriter was designed and manufactured in Switzerland by Paillard S.A. of Yverdon, Vaud. The design of the 2000 was first introduced in 1933, and the model I have for sale is from 1956, which is determined by the serial number. This machine features full-metal construction, with plastic keys and platen knobs. It is in the classic minty-green Hermes color scheme. While this is technically a portable typewriter, it is something you would prefer to keep on a desk, rather than take for casual picnics in the park. It's size means the typing action is fantastic - it needs a very light touch to print the letters (pressing too hard on the keys will result in double spacing), and so there's no risk of losing your fingers in the keys! Also great if you're used to typing on a computer and haven't used a typewriter in a while. The space bar shows some light discoloration and a superficial crack, but it does not in anyway affect the functioning of the typewriter. As you can see, not only can it print all the special accents and characters in French, but it also has a key especially for the Swiss currency (Fr)! I shall catalog here not only what I have for sale, but also what I have already sold (loved and lost, as it were), in addition to my forthcoming (very important!) posts on my own interest in typewriters, as well as the many uses of typewriters in 2010. Trivia: Hermes typewriters were designed by Paillard S.A. of Yverdon, Switzerland. Production was also based in Yverdon until the mid-sixties, when it moved first to Germany and then to Brazil (where this model was manufactured). The company pioneered the very first ultra-lightweight portables with the introduction of the original Hermes Baby in 1935. As someone who has seen all the generations of the Hermes Baby, I can vouch that this latest version is not so different (weight and size) from the very first one, but has many more nifty features! I told my sister the other day that I was selling typewriters, and she asked, "Typewriters? I thought people were using computers now!" I had a good chuckle about that. If you have made it as far as this page, you may be asking me the same questions: Why would anyone sell typewriters in 2010? Why would I need or want a typewriter? Why are YOU selling typewriters in Geneva??? The short answer is this: I am selling typewriters because I have several, and I cannot keep all of them. But a longer answer is warranted, so here we go. Just over a year ago, I was searching for housing in Geneva, and if you've ever been there, you will remember that it requires filling out many, many forms. Because housing is hard to find, you will have to fill out similar forms from different agencies several times over. Before we were finally accepted for ONE apartment, we had applied for 50! As I wrote in these forms till my hand cramped, I wondered if there were not a mechanized way to do it. Computers would not do, of course, but then my husband suggested a typewriter and a light bulb went off. Finding a typewriter in Geneva, and especially one in working condition, turned out to be easier said than done. After several weeks of searching, I happened across one at the flea market and hustled it home gratefully. It needed work, though, and cleaning, and new ribbon, but after several hours of elbow grease, I had a working typewriter. I was delighted. A couple of months later, I came across some more typewriters. I was torn - I already had one, why would I need several? And yet, the vision of these once-sought after machines being trashed after years of neglect made me queasy. So I purchased them, brought them home, nurtured them back to life, and wrote with them: letters to friends and family (who were bemused at my new-found obsession), blog posts that I would later scan into the computer and upload (and here one could rightly ask, why not type directly?). But I needed to use these machines, to give them some attention after the decades they had spent in the dark. As an aspiring creative writer/ essayist, I found that being behind a typewriter was a different sensation altogether than using a computer. There were no distractions, no email-checking, no facebook chats. Once I sat down in front of a typewriter and rolled up a piece of paper, I had to actually write. No excuses. It was liberating, and yet intimidating. I'm still trying to muster the discipline it takes. In the meantime, there were more typewriters to be discovered, almost all in various stages of disrepair. My beleaguered husband watched as the cases piled up in our tiny apartment. As a watchmaker, he is gifted with tools and I rely heavily on him to tune up the machines I bring home. Sure enough, the day come when he said gently: "Enough. We have too many typewriters!" He is also a fan, but he is more practical than I. Even if we are buying them to save them from incineration, it is a fact that we cannot keep all of them. Looking on the internet, I realized that several Americans are now into vintage typewriters - prices on Etsy and eBay constantly veer into the realm of the ridiculous as a result. It occurred to me that perhaps, somewhere in Geneva, there could be others like me - interested in rediscovering a typewriter, and keeping one for their own use. It is important to state here that I am not asking unjustifiable prices for these typewriters. 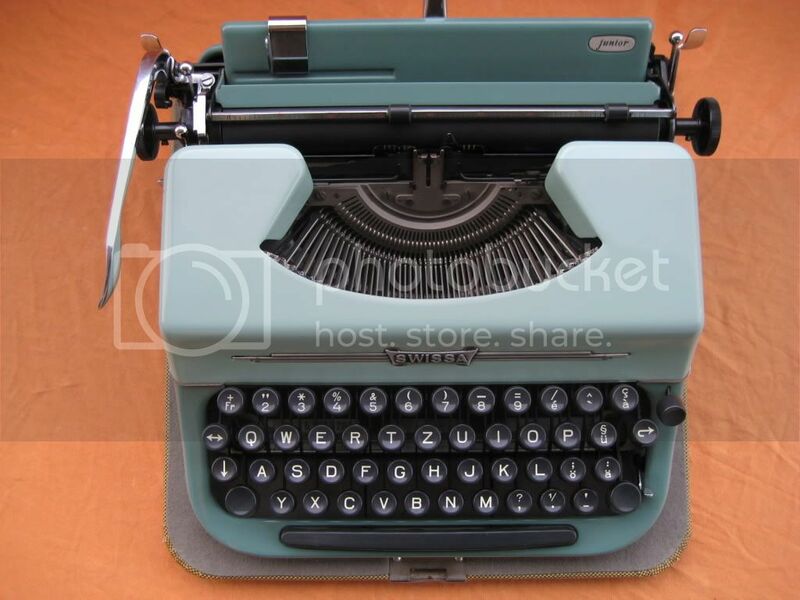 In fact, I was surprised (although in retrospect, perhaps not) to receive a call from a lady in New York asking to buy my Hermes 2000 typewriter, because I am selling it for a tenth of the price asked by vintage typewriter webshops in the U.S. I turned her down because I do not care to deal with the hassle of packing and shipping, and also because I had already found several prospective buyers in Geneva. And who better to rediscover a Swiss typewriter, I thought selfishly, than someone living in Switzerland? Retro Tech Geneva is not an official business per se - it is my personal Etsy store, so to speak. I want to help anyone in Geneva who would be interested in having a vintage typewriter to acquire one. At the same time, I would also like to save these machines, many of which sold for a pretty penny and were very much desired only a few decades ago, and could still be used if properly serviced. So I buy them, clean them up carefully (scraping off sixty-year old grease and accumulated gunk, removing old Tipp-Ex, ink, eraser rubbings, dirt, dust bunnies, and pet hairs), and then, with my husband's help, service the mechanisms. I test the typing action, and provide a type sample. I replace the ribbons with fresh dual-color ribbons if the machine is equipped to take them, or black ones if not. And then, because I already have many more typewriters than I can use, I offer them to you. Perhaps you live in Geneva and would like to pay a little more (or even the same or less!) as an antique shop would charge, if you could get a fully-functioning portable manual typewriter, with a fresh ribbon, ready to write your correspondence and memoirs and even pass on to your children. If so, please look around on this blog, and let me know if any of the machines I have refurbished is of interest to you. I live in Eaux Vives, close to the center, so you can come over, roll in some paper, and test the machine before you buy. If you have a problem later on, I'll be glad to take a look and offer you my advice (I cannot give an official warranty because I am a private person). Thank you for reading.